Sometimes when you’re a small company it can feel like the whole world is against you. Prospects are unsure of you, vendors treat you like yesterday’s cat litter, and potential employees look at you with a wary eye. But it doesn’t have to be that way. Karen Post at Oddpodz recently posted four suggestions on how to deal with being small, and turn disadvantages into advantages. The only thing I’d add is remember that business communications technology like MyFax, my1voice and Campaigner can also help you get past the “too small” syndrome by making you look larger than life. Since they’re services instead of technology you install, they can also save you hours of frustration by removing the need to manage them. “Going green” often has a costly connotation associated with it. But when it comes to examining everyday technology in the office, going green can be easy, and positively impact the bottom line by saving money. In our second podcast, MyFax Product Marketing Director Luc Vezina chats with GREENandSAVE.com president Charlie Szoradi about simple ways businesses can “green” their office technology. Lowering power consumption and paper reduction are easier than you might think! What simple modifications have you made to green your office operations? This week we announced a new free resource: 100 free fax cover sheets available at http://www.myfax.com/free-fax-cover-sheets. Cover pages distinguish who you are and to whom you are sending a fax. It’s also a good way to brand yourself with your company logo, website and contact information. This is an easy and free way to add value to your brand without hiring a graphics department or using valuable company letterhead. The cover pages are available in Microsoft Word format and can be edited and customized. The formats run the gamut - from business to urgent and even fun. There are also cover pages for industries including accounting, bookkeeping, construction, education, finance, legal, medical, nonprofit and real estate. If you are looking for something else, let us know here and we’ll see what we can whip up! Came across this site today as I was doing some competitive research for MyFax and just had to share. It’s a cartoon called “The secret life of the fax machine” that shows both the history and mechanics of faxing. It’s chock full of trivia and explanations about aspects of how fax machines work that you probably never knew. I know I didn’t. The “modern” information is a little outdated since it focuses on the mechanics of old thermal paper fax machines and doesn’t mention the option of Internet faxing at all. Still, if you like watching the History or Discovery channels it’s worth a look. Especially on the off-chance you are ever a contestant on Jeopardy! and one of the topics is faxing. Anyone care to speculate what information was being sent on those early faxes? According to Frank Nothaft, chief economist at Freddie Mac, “Newly released housing indicators contain positive signs that the worst may be behind us.” And the National Association of Realtors just announced sales of existing homes rose more than expected in June, so the race to secure a great rate is on, but how secure is the financial information you’re providing? Remember to securely submit sensitive financial information when applying for your loan. Consider MyFax if you’re sending personal information and signed documents. MyFax, the world’s fastest-growing Internet fax service, protects against prying eyes around a common area fax machine. When users send a document to a fax machine, it sits there until the person it’s intended for picks it up, or the document is delivered. In the meantime, anyone walking by can see what’s in it. With MyFax, the documents are sent directly to the email of the receiver, maintaining the ultimate level of privacy for financial information. For those who only occasionally fax, MyFax also offers a free service. MyFax Free allows users to transmit two faxes per day of up to 10 pages without going through the fuss of setting up an account or providing a credit card number. Good luck securely obtaining those rates! We’re so excited to share the first of many podcasts we’ll be conducting with our Director, Product Marketing and various customers. We hope to inform, educate and give you a peek inside MyFax. Our first podcast features how Chris Prescott of Coldwell Banker, who uses MyFax to streamline his real estate business operations. Listen, and let us know what you think of our first run at a podcast, and what topics you’d like to see covered in the future! Typically we use this blog to share tips and tricks about MyFax and small business communications. Today I’d like to do something a bit different and give you a personal look at all of us at MyFax and at our company Protus. I am really proud of the people I work with. We provide great products. We all get great satisfaction from hearing this from our customers. But at MyFax, this isn’t all we live for. Our company has chosen to work with the Canadian Cancer Society and its Relay for Life program. We’ve been involved for the past five years, donating time, money and as of this year, sponsorships. This year we raised over $30,500 for the Canadian Cancer Society. 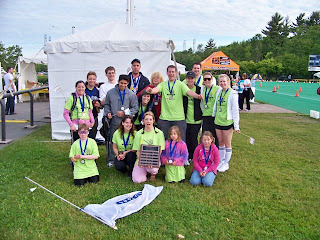 We began fundraising several weeks prior to the annual 12-hour relay at the Nepean Sportsplex on June 12, 2009. The company raffled off retreats with executives. We paid to throw pies at our bosses and watch the accounting department shave their heads. We had a lot of fun voting with loose change on daily opinion polls that often pitted one department against another. And we held silent auctions, a garage sale, cook-offs and all sorts of other food-related fundraising. As a result, Protus raised the most funds as a team, totaling nearly $150 per employee. In fact my co-worker Pat Risdon raised the most money by an individual for the Ottawa-Nepean community. Personally, something really struck me this year as we celebrated our efforts at our picnic. Protus has retained its personal approach and commitment to this annual event. This effort started from humble beginnings based on a very personal journey of one employee. Despite our growing size, everyone still embraces the company’s charity of choice as their own. I am really honored to be a part of this professional family. There truly is a heart behind the company. Relay For Life is a celebration of survival, a tribute to the lives of loved ones and an opportunity to fight back in the battle against cancer. Teams of 10 take turns running, walking or strolling around the track in this non-competitive 12-hour relay. Taking part in this heart-warming event creates a strong community of people striving to reach a common goal – to beat cancer. The Canadian Cancer Society is the largest charitable funder of cancer research in Canada. The funds raised by Relay For Life are used to support life-saving research, provide information on cancer prevention and to offer support services to those living with cancer.